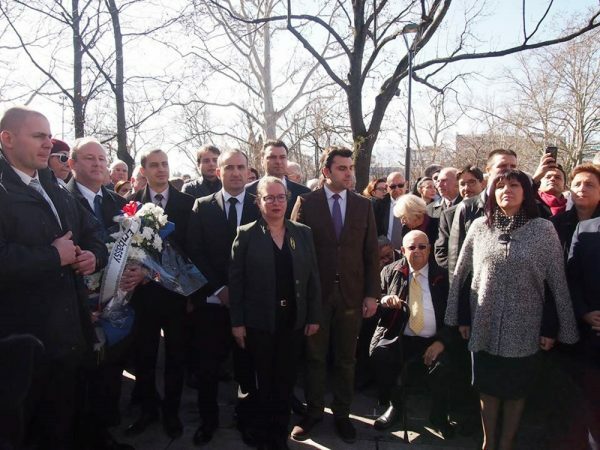 A wreath-laying ceremony in central Sofia and the launch of a book in the Parliament building were among key events on March 9 2018 as Bulgaria marked the 75th anniversary of the rescue of the Bulgarian Jews from the Holocaust. The 75th anniversary events equally commemorate the 11 343 Jews from territories in northern Greece and Yugoslavia, then under Bulgarian administration, who were deported to the Nazi death camp at Treblinka. Photo via the Facebook page of the embassy of Israel in Sofia. 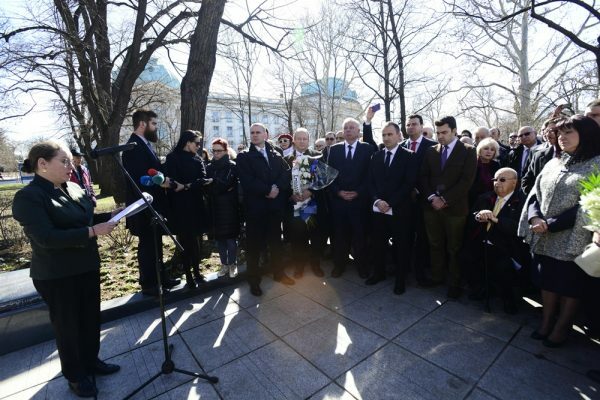 The floral tribute ceremony at the monument of gratitude for the rescue of the Bulgarian Jews, close to the Parliament building, was attended by representatives of state, government and municipal institutions, diplomats, members of the Bulgarian Jewish community and of Bulgarian Jewish organisations from Israel who are in this country for the 75th anniversary commemorations. 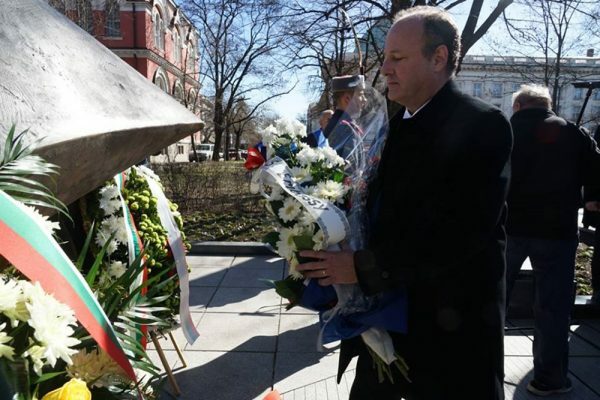 US ambassador Eric Rubin at the floral tribute ceremony. Photo: US embassy. Irit Lilian, ambassador of the State of Israel, addresses the ceremony. A duplicate of the memorial of gratitude in Sofia is to be inaugurated in the Israeli city of Tel Aviv in June 2018, Israel’s ambassador in Sofia, Irit Lilian, told the ceremony. 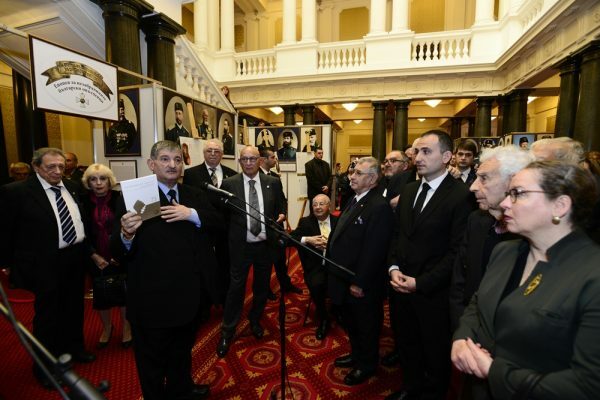 At the Parliament building, the book published by the Organization of the Jews in Bulgaria “Shalom” was launched. The volume, “75 Years. Unforgotten Faces of the Rescue”, pays tribute to ordinary Bulgarians who played a role in resisting the deportations and the official anti-Semitic policies of the government in the 1940s. The presentation of the book ’75 Years. Unforgotten Faces of the Rescue’ in Bulgaria’s Parliament. 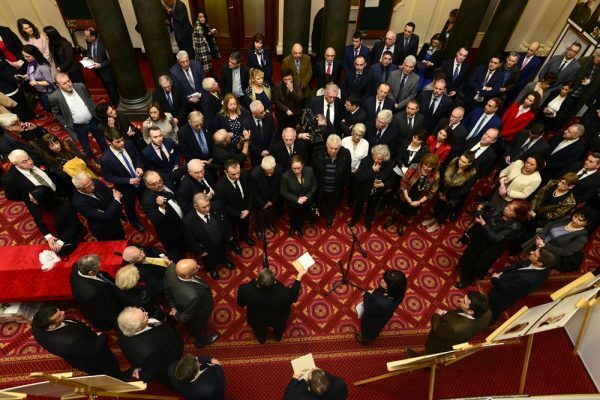 The Speaker of the National Assembly, Tsveta Karayancheva, said that the rescue of the Bulgarian Jews was one of the most striking manifestations of civil society in Bulgaria in the 20th century. The Speaker of Parliament, Tsveta Karayancheva, and Dr Alexander Oscar, President of the Organization of the Jews in Bulgaria ‘Shalom’ with the Shofar award presented to the National Assembly on the occasion of the 75th anniversary of the rescue of the Bulgarian Jews, in which some of the ruling majority MPs of 1943 played a major part. Bulgaria’s Foreign Ministry said on March 9 that a memorial tree-planting ceremony had been held two days earlier at the US National Arboretum in Washington, DC, marking the 75th anniversary. The seeds for the oak were provided by the Botanical Garden of Sofia University. Bulgaria’s ambassador to the US, Tihomir Stoichev, said that the rescue of the Bulgarian Jews was the result of the determined actions of civil society, the Bulgarian Orthodox Church, intellectuals and lawmakers. At the tree-planting ceremony, a minute’s silence was held for the victims of the Holocaust. On the evening of March 10, as part of the 75th anniversary commemorations, the launch of the English-language edition of a book commissioned by the Organization of the Jews in Bulgaria “Shalom”, entitled “Bulgarian Jews: Living History” will be held.